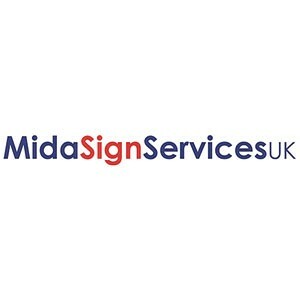 Mida Sign Services UK Ltd, is a nationwide installer for all types of Signage, Graphics and Banners. The company was formed in January 1984, and offers our clients various types of installation services backed up with support from our knowledgeable office team who are committed to ensure that our contracts run smoothly, efficiently and to time. We donât just install signs, as our company name implies, our work is extremely varied, especially with digital print and graphics, which we install onto glazing, floors, walls and vehicles etc, we also install banners from large one offs, too promotional roll out programs, all nationwide. We install large illuminated flex face signage, and built up internally illuminated letters with LED, but we donât seem to get much call for neon, thatâs not to say we canât install or maintain it, just that LED seems to be taking over. Same as vinyl and digital print has taken over sign writing. Safety issues have become more important in the signage trade, site work requires risk assessments and method statements, engineers have to be qualified and have CSCS, IPAF, PASMA and First aid training. The company has also gained the accreditation of approved safe contractor for health and safety standards, as well as being members of the British Sign and Graphics Association. Our installation services is backed up by our Sign Maintenance services which includes, Sign repair, Sign services, full clean and replacement of fluorescent tubes, etc. Edit MIDA Sign Services UK Ltd.